Seniors, what are you planning to do after high school? College? Military? Workforce? Whatever you decide, you need a plan! 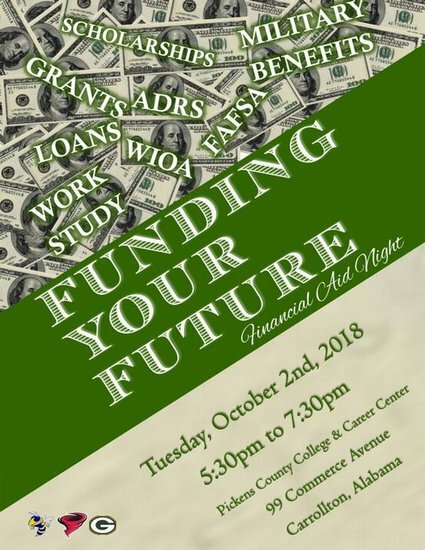 Meet us at the Pickens County College and Career Center on Tuesday, October 2nd, 2018 at 5:30pm for our “Funding Your Future” Night. 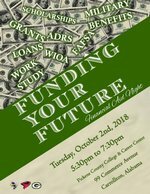 We’ll have college admissions reps, financial aid specialists, and military recruiters here to give you information about ways to FUND YOUR FUTURE! Need to complete your Financial Aid Form? We will have our FAFSA lab open from 6pm until 7:30pm! There will be a special giveaway to every student who attends! Come out Tuesday, October 2nd, 2018 at 5:30 p.m. at the Career Center! Again that’s Tuesday, October 2nd at 5:30pm! See you there!